Motorola recently announced the Droid 4, a 4G LTE-compatible QWERTY phone that will hit retailers in coming weeks. The first thing anyone will notice about the phone is how sleek and Razr-esque it feels in your hand. 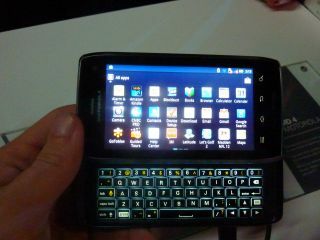 It's a QWERTY phone with a slide-out keyboard, but upon first handle it felt a bit like a slightly chunky touch phone. That's because at .5-inches it's surprisingly thin - thin enough for Motorola to bill it as the world's thinnest LTE QWERTY phone. But all that wouldn't much matter if the keyboard was garbage, and we're happy to report that we were able to quickly type on it, without having to relearning much of anything. The keyboard is edge lit so you type in the dark with rounded keys that help you find the tiny buttons you're looking to type. The Droid 4 is currently running Android 2.3.5, but should get a bump to Android 4.0 in the first half of the year. It's slightly more powerful than its predecessor as well. It has a 1.2 GHz dual-core processor and 1GB of RAM, and we tested a variety of intensive apps and each were smooth and fast. The Droid 4 also has an 8MP rear-facing camera capable of 1080p HD video capture. Our test pictures looked mediocre at best, but we'll wait to pass final judgment for when we have a bit more ideal lighting circumstances (Motorola's booth was exceptionally dark). Other than that, many of the specs should look familiar. There's the same sized scratch resistant 4-inch display, 16GB internal memory (which can be expanded with up to a 32GB microSD), and LTE Hotspot capabilities. So how much will this slider cost you? No firm price has been released, but rumors suggest the phone will release for $249 with a two-year contract. Motorola also announced the Droid Razr Maxx, which adds a slight bulk to its wonderfully thin Droid Razr but adds a gargantuan 3300 mAh battery. We'll let you know when official details surface for either of these phones.